This is one of my family’s favorite kind of potatoes that I make. They take only about 20-25 minutes to make. I like them because they are easy, fast, and tasty. In a large bowl toss potatoes, vegetable broth and seasoning to coat potatoes. 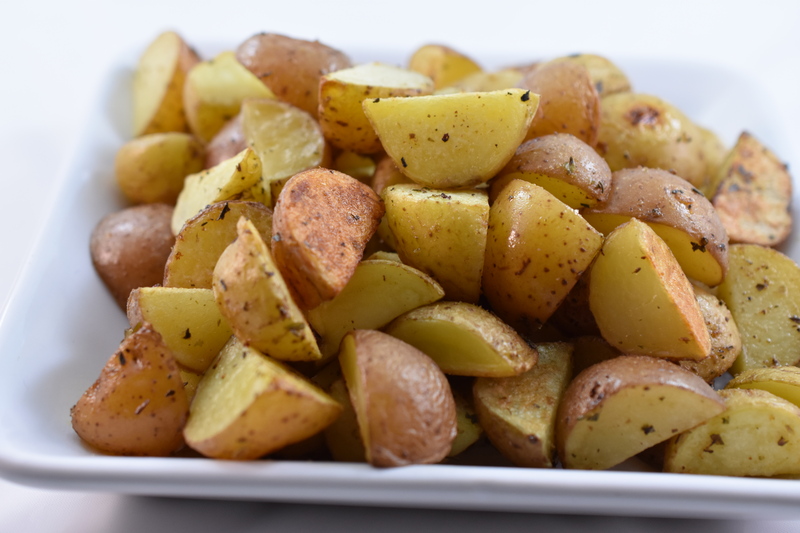 Place potatoes on prepared sheet pan (parchment paper or silicone mat). Bake in oven for about 20 minutes, or until fork tender. Stir after 10 minutes. This is my favorite carrot side dish. It has the perfect balance of orange and ginger. This recipe calls for roasting the carrots first. Roasting the carrots brings out the natural sugars and develops the flavor of the carrots. Place carrots in a large bowl. Add broth and seasoning. Toss carrots so they are well coated. Spread carrots out on to a sheet pan in an even layer. Roast in oven for 30 minutes, or until carrots are easy to mash with a fork. Add carrots, vegan butter, orange zest, orange segments, and sweetener. Pulse until carrot mixture is a puree. I have not made these in a long time, and I do not know why. They are so delicious. They make you feel like you are cheating, but you are not. These are a wonderful treat and so easy to make. Just a little FYI – these are only 2 smart points each, if you are following weight watchers. Add dates, almond butter and cinnamon to food processor. Pulse until well combined. 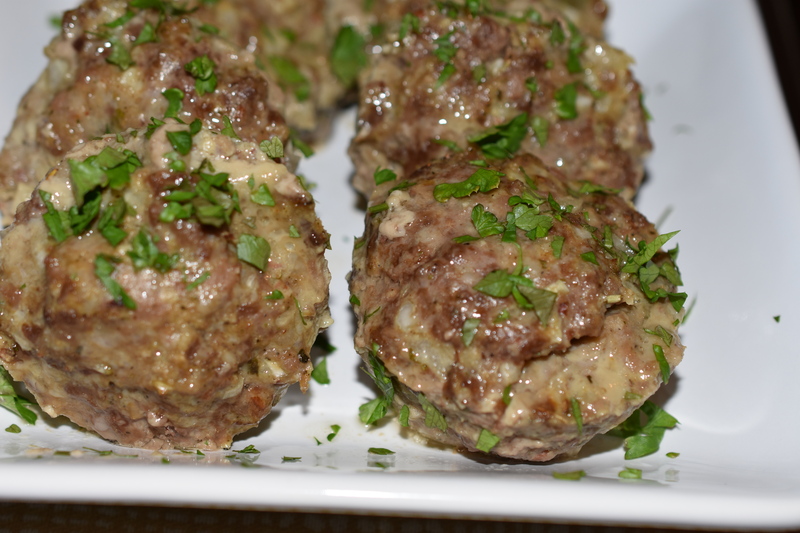 Use a tablespoon to scoop out mixture and roll into balls. Place on a sheet pan lined with either a silicone mat or wax paper. In a small bowl melt chocolate in the microwave for 30 seconds, stir. Repeat. Remove bowl from microwave, stir well. 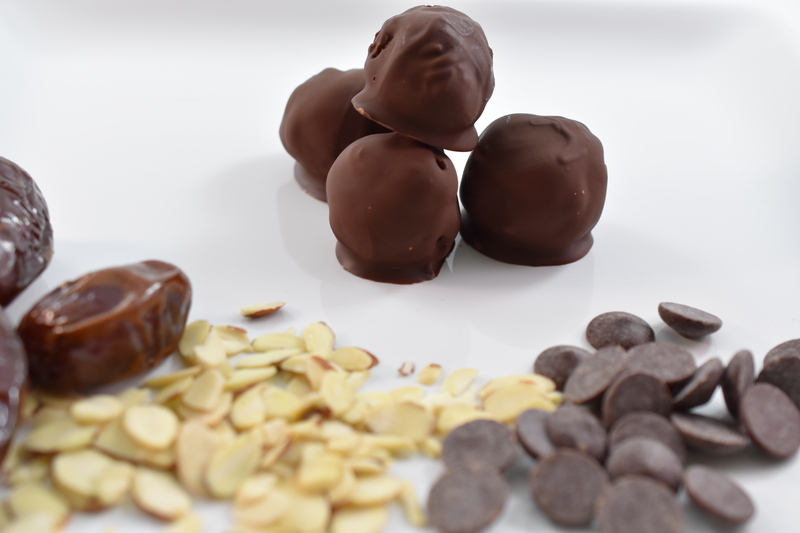 Place 2 date balls into the melted chocolate and turn to coat. Lift out of bowl letting the excess chocolate drip back into bowl. Place truffle back onto silicone mat, wax paper. Repeat with remaining truffles. Freeze for 10 minutes. Remove from freezer and transfer to a container with lid. Store in the refrigerator. Eat. Share. Enjoy. I had forgotten how good this smells when this is on the stove for a low simmer. Low and slow is what makes this so good. It lets the flavors meld and develop. This recipe makes a lot of sauce, so use what you need today and freeze the remainder for another night. In a large dutch oven over medium heat cook onion and garlic until onion is translucent. Sprinkle seasoning (about 1/2 – 1 tsp each time) over onion mixture. Add the ground beef and brown; when the ground beef is browned sprinkle more seasoning and stir. Let cook for about 2 minutes to develop the added seasoning. Add the tomato paste and cook with the meat mixture. Work the paste into the ground beef, melding the flavors. Add diced tomatoes, tomato sauce; stir well. Add more seasoning, maple sugar and the bay leaves. Cook on low for 2-3 hours. Serve over some vegetable noodles. 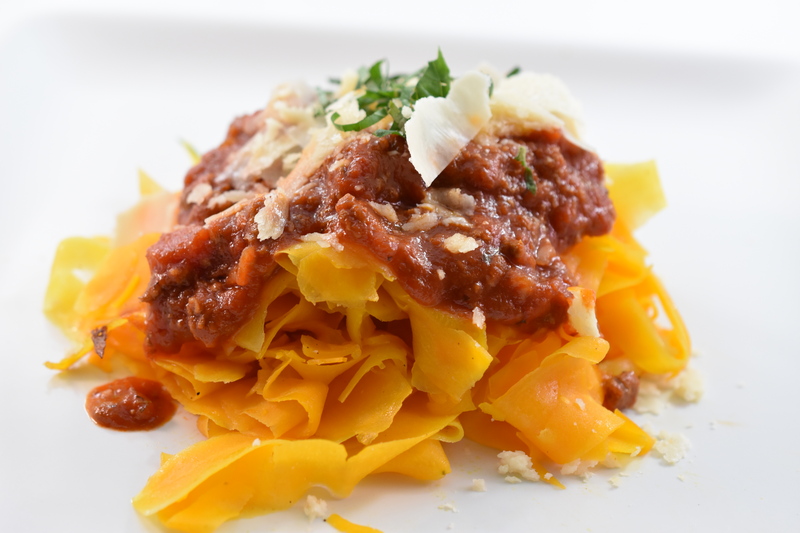 Butternut squash noodles pair very nicely with the meat sauce. Serve. Eat. Enjoy. I intended to make some blueberry muffins, but I had been wanting to make a clafouti for a couple of weeks. So the blueberries became a french dessert. Tasty. Preheat oven to 350 degrees. Grease a 9 inch ceramic or glass pie plate. Toss blueberries with arrowroot, spread in an even layer on bottom of prepared pie plate. In a large mixing bowl whip aquafaba to stiff peaks. Fold aquafaba into the cashew cream, vanilla and maple syrup. Whisk together the flour, lemon zest, and sea salt. Gently combine wet and dry ingredients. Pour batter over blueberries and sprinkle with almonds. Bake until clafouti is puffy and golden, and a knife inserted in center comes out clean, 50-55 minutes. Remove from oven and let cool for at least 15 minutes (center may sink). Sprinkle coconut sugar and slice into 8 pieces; serve warm or at room temperature. Top with whipped coconut cream. 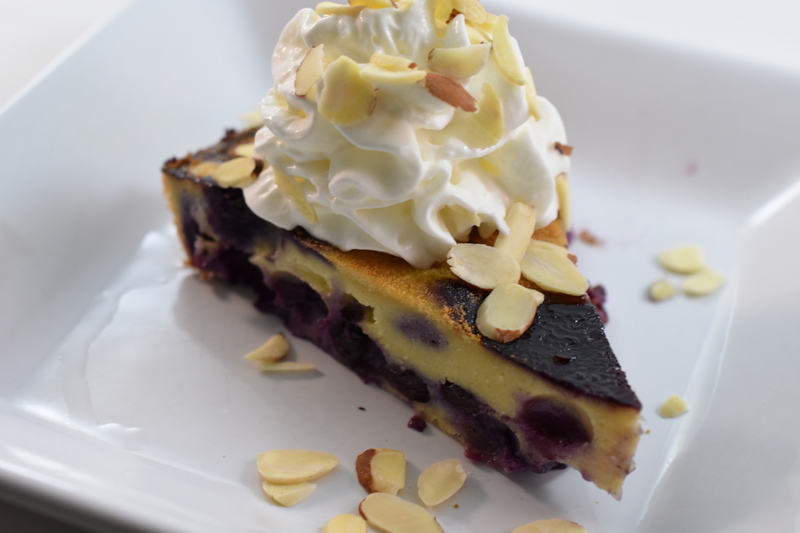 Some of my recipes have called for cashew cream (Pumpkin Cheesecake, Blueberry-Almond Clafouti), so here is the recipe. You can use this instead of heavy cream. The possibilities are endless. Place the cashews in a bowl and cover them with boiling water. Cover the bowl and soak for 4-8 hours. Drain and rinse cashews. Transfer them to a high speed blender and add water, lemon juice, salt, and vinegar. Blend the mixture on high until very smooth. You may need to scrape down the sides of the blender midway through blending. Cover and refrigerate for at least 2 hours before using or for up to 3 days. Anyone who eats Paleo knows it is hard to find a good Paleo biscuit. These are light and the flavor … yum. I made sliders with these. Add almond flour to a food processor, and pulse. By doing this you are making the flour a little more fine. Add tapioca flour, salt, baking soda, and baking powder. Pulse processor 2-3 times to combine ingredients. Add 4 eggs, butter and honey to processor and mix until dough is well combined. 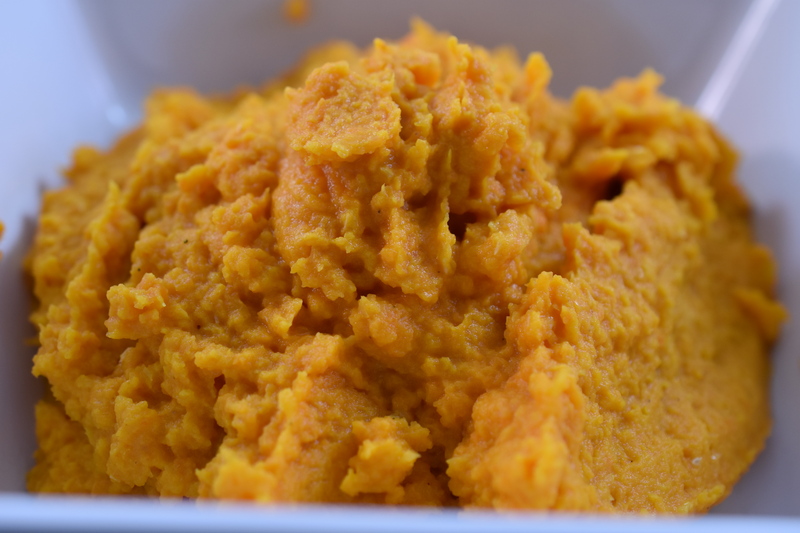 Transfer to a medium size bowl and refrigerate for at least one hour, up to 3 days. Preheat oven to 350 degrees and line baking sheet with parchment paper.Divide dough into 8 equal size balls. I found it was easier to press the dough into shape, rather than using a rolling pin. The dough tends to stick to the rolling pin. Press dough into 1 inch thickness. Place on prepared baking sheet. Brush biscuit with the remaining egg (beaten). Bake in oven for 15 minutes or until golden brown. 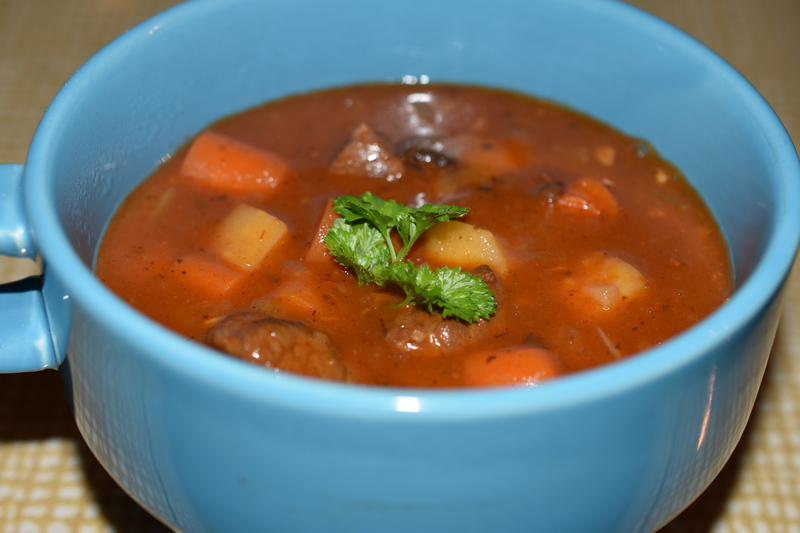 I had been thinking about making beef stew for a few weeks. The trick to making this especially delicious is actually roasting it in the oven. The ingredient list may seem long; however, if you are cooking paleo you will probably have most of these in your pantry. In large ziplock bag add tapioca flour, 1 tbsp all-purpose seasoning, and beef. Close bag, and shake so that the beef is well coated. Set aside. In a large dutch oven heat olive oil over medium heat. Add garlic and cook until fragrant. Add beef to garlic and brown meat. Stir occasionally. When meat is browned add onions, carrots, celery, parsnips, and mushrooms. Cook until onions are translucent. Stir in tomato paste so that it is well incorporated with ingredients in the dutch oven. Add white wine, scraping the cooked bits off the bottom of the dutch oven. This is where lots of flavor will come out. Stir in 3 cups of beef broth. Cover dutch oven and transfer to oven. Roast in oven for one hour stirring occasionally; then test tenderness of vegetables. When they are almost to the tenderness you desire make a slurry with the remaining beef broth and the arrowroot. Pour slurry into stew and stir. Cook for another half hour. Remove form oven, stir well and serve. Eat. Enjoy. I really like seafood, and salmon is one of my favorites. It is so easy and fast to make. Brush sheet pan with olive oil. Place salmon filets on sheet pan. Brush salmon with olive oil. Sprinkle mediterranean seasoning on salmon. Bake salmon for 8-10 minutes. Garnish with a squeeze of lemon. Serve. Eat. Enjoy. I made these in an attempt to try portion control. It actually worked well. When these bake in the oven the kitchen smells so good. Add smashed potatoes and the roasted brussel sprouts and cranberries and you have a very filling meal. This is a dump all together and mix with your hands kind of recipe. Really, that is all you have to do. I used a 12 well muffin pan. Fill each well with the meat mixture. All the meat mixture should fill all the wells perfectly. Bake in the oven for 20 minutes. Serve. Eat. Enjoy.